It’s much the same with Scripture. When we first begin to spend regular time in the Word, it has an excitement, freshness, and vibrancy that clears the cobwebs from our minds and helps our eyes to open and focus. But do we really think of it as “good to the last drop”? Do we continue to spend regular time in it, uncovering new riches and gaining new strength—or are we content to learn a handful of famous verses and then set it aside? The reason there is nothing so dangerous as this is because of the nature and function of the Word. It is “living and active” (Hebrews 4:12) and serves to reveal and exalt Jesus Christ, the Word-made-flesh (John 1:14). We cannot claim to have a love for Jesus Christ while simultaneously ignoring or trivializing the Scriptures that magnify him and that he himself so deeply loved. The discipline of spending daily time in the Word is not a mechanistic means of accruing favor with God, nor is it an obligatory yet loveless duty. It is not something that we outgrow. It is, instead, a time to be guided to the living Christ, fed by the Spirit, and instructed in the ways of the Lord. Take some time today to be rejuvenated, awakened, and energized—not by a good cup of coffee (although that is a blessing! 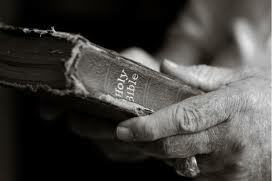 ), but by the words of eternal life given to us by our Eternal God. Every last drop is true. Every last drop is good.